Destiny 2 classes are the foundation of your character and campaign. Bungie’s solar system is home to three core classes: Titans, Warlocks, and Hunters. There are subclasses within these main roles, meaning there are both broad and fine strokes in regards to how you build your character. Want to know what those are? We’ve got the full lowdown on every subclass, plus details on the new Destiny 2 Forsaken supers and subclass paths. Each subclass has three core abilities that will recharge over time: a grenade, a class ability, and a melee power (you’ll always be able to make a melee attack, but it’ll have an additional effect when your melee power is charged). 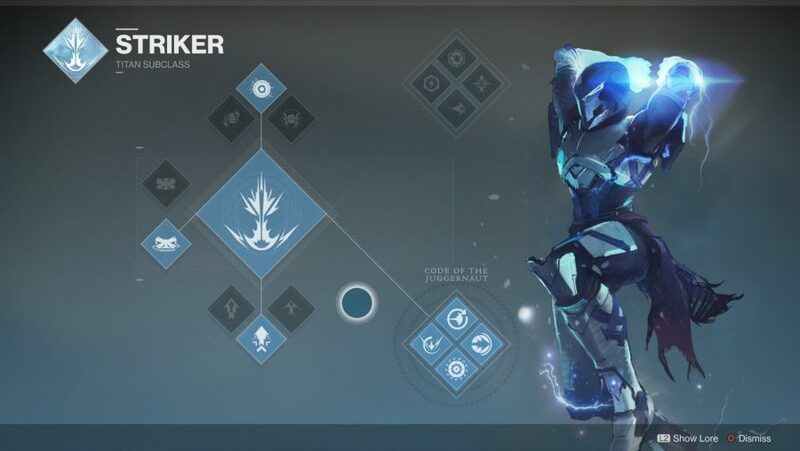 Each subclass also has a unique and devastating ‘super’ ability on a much longer cooldown, and a choice of two perk trees, which will further modify all these powers. 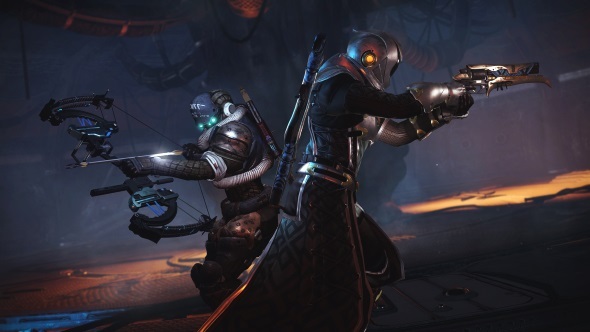 Destiny 2 features three brand-new subclasses, which join three reworked ones returning from the original, and another three from The Taken King expansion. That’s right – Stormcaller, Sunbreaker, and Nightstalker are all in Destiny 2. 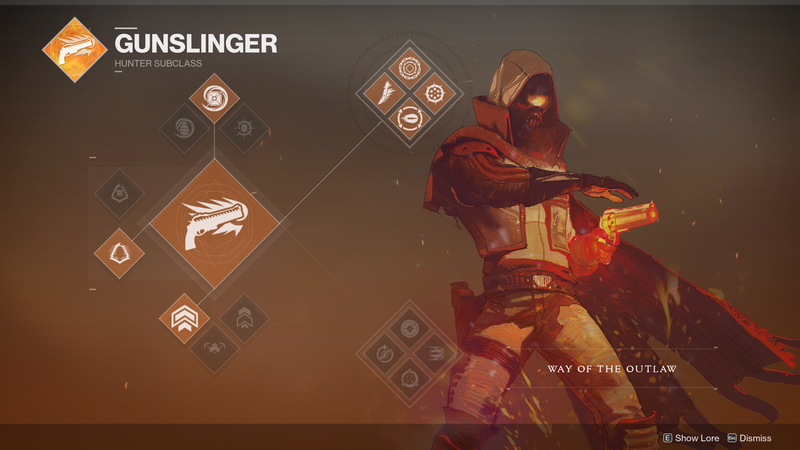 At the start of your Destiny 2 campaign, you will only have access to a single subclass. 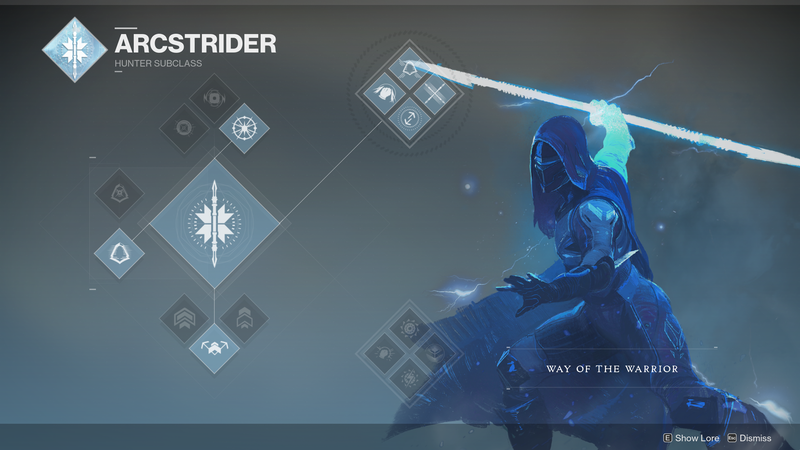 This will be the newest ability set for your main class, so Arcstrider, Sentinel, or Dawnblade depending on if you’re a Hunter, Titan, or Warlock respectively. To unlock your second and third subclass you’ll need to find a subclass relic. These have a high chance to drop from any chest in the game after you’ve reached the necessary level threshold, which seems to be level seven for the first, and level 14 or 15 for the second. Once you have your relic, you’ll need to charge it by killing things. When it’s fully charged, you’ll get given a special mission. Complete that to unlock your new subclass. For full details – like which subclasses unlock when – click here. 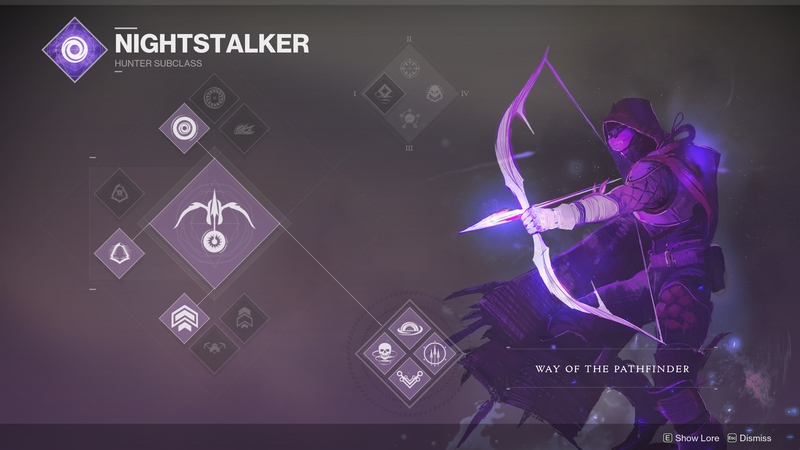 The upcoming Destiny 2: Forsaken expansion adds nine new subclass paths to the game, which include brand new or highly modified super abilities. These change the playstyle of every one of the game’s existing subclasses, providing each with a brand new lease of life. Solar Grenade – a grenade that creates a flare of Solar Light that continually damages enemies trapped inside. Healing Rift – conjure a well of Light that continually heals those inside it. Empowering Rift – conjure a well of Light that increases weapon damage for those inside it. Strafe Glide – jump while airborne to activate Glide and start an airborne drift with string directional control. Burst Glide – jump while airborne to activate Glide and start an airborne drift with a strong initial boost of speed. Balanced Glide – jump while airborne to activate Glide and start an airborne drift with both moderate speed and directional control. Winged Sun – engage your enemies mid-flight. Fire weapons and throw grenades while gliding. Heat Rises – airborne kills recharge your grenade and melee energy. Casting Daybreak instant refills all your ability energy. Icarus Dash – dodge in mid-air. Swift Strike – strike an enemy with this melee ability to burn your target and temporarily increase your movement and reload speed. Igniting Touch – strike an enemy with this melee ability to burn them and cause them to explode when killed. Fated For The Flame – Daybreak projectiles seek targets as they travel and, upon impact, launch a streak of deadly flames. Everlasting Fire – killing an enemy with Daybreak extends its duration. Phoenix Dive – descend from mid-air to quickly restore your health. While Daybreak is active, descending causes explosive damage. 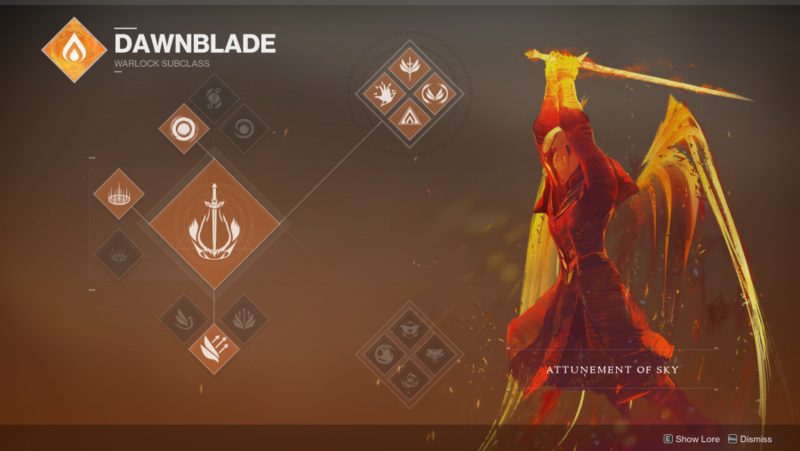 Super: Well of Radiance – slams your Dawnblade solar sword into the ground, creating a much larger variant of the Warlock rift that both rapidly heals and buffs allies. Divine Protection – hold down the grenade button to transform it into a Blessing bomb, that heals allies and drops collectable overshield orbs. Guiding Flame – a melee attack that burns enemies and offers an empowering buff to nearby allies. Benevolent Dawn – regenerates your melee, grenade, and rift abilities when empowering or healing allies. Super:Nova Bomb – Hurl an explosive bolt of Void Light at the enemy, disintegrating those caught within its blast. Vortex Grenade – A grenade that creates a vortex which continually damages enemies trapped inside. Axion Bolt – A bolt of Void Light that forks into smaller bolts on impact that seek out enemies. Scatter Grenade – A grenade that splits into many submunitions and covers a large area with multiple explosions. Blink – Jump while airborne to teleport a short distance. Chaos Accelerant – Draw power from your Super to overcharge your grenade, making it deadlier and more effective. Bloom – Void ability kills cause enemies to explode. Cataclysm – Nova Bomb travels slowly and seeks enemies. Detonations shatter into smaller seeker projectiles. Fire your weapon at the Nova Bomb to detonate it early. Entropic Pull – Strike an enemy with this melee ability to drain your enemy’s life force and use it to recharge your grenade. Devour – Kill an enemy with this melee ability to fully regenerate your health. For a short time afterward, kills restore additional health. Feed The Void – Consume your grenade energy to regenerate your health. Grants the Devour effect. Insatiable – While the Devour effect is active, killing enemies extends its duration and recharges your grenade. Vortex – Nova Bomb creates a singularity which continually damages enemies trapped inside. 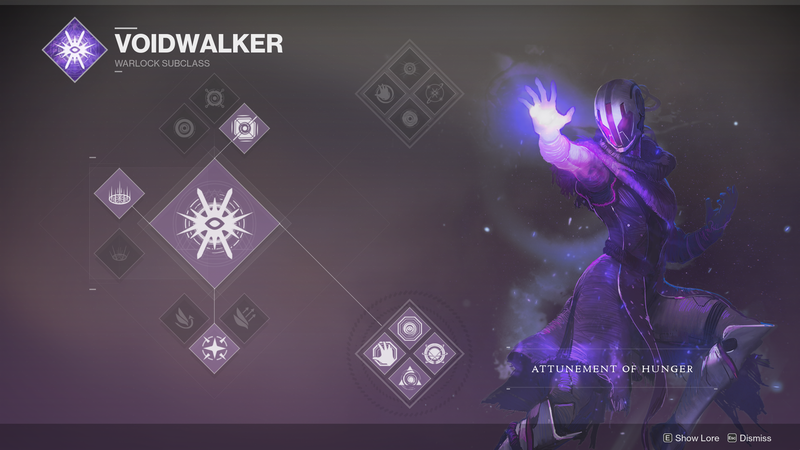 Super: Nova Warp – allows the Warlock to teleport short distances using the melee button, and then erupt in an energy explosion. The explosion can be triggered multiple times, provided super energy remains. Atomic Breach – a ranged melee attack that creates a void explosion. Handheld Supernova – holding down the grenade button creates a short-range Supernova explosion. Dark Matter – any void ability kills heal you and grant ability energy. 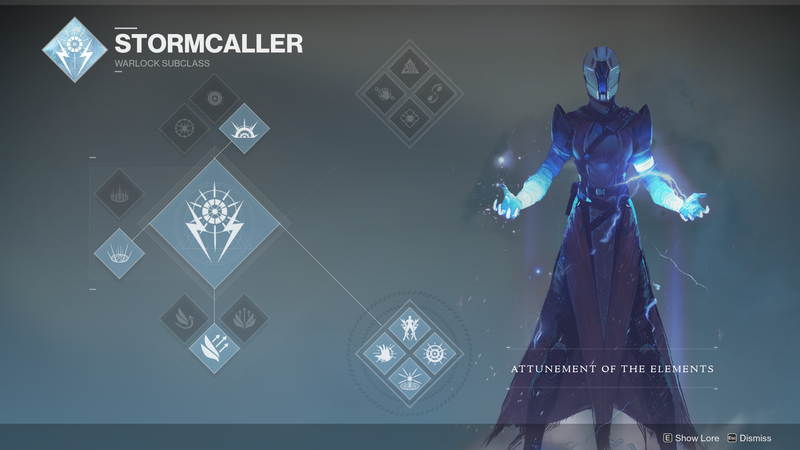 Super:Stormtrance -While active, Stormtrance allows a Stormcaller to float across the battlefield, electrocuting and disintegreating foe after foe. Arcbolt Grenade – chains bolts of lightning to nearby enemies. Pulse Grenade – periodically damages enemies inside its explosion radius. Storm Grenade – calls down a focused lightning storm. Controlled Glide – jump while airborne to activate Glide and start an airborne drift with string directional control. Chain Lightning- Deliver an electrocuting Arc melee strike at extended range that chains from the struck target to another enemy nearby. Transcendence – When cast with full grenade and melee energy, Stormtrance lasts longer and fully restores health. Arc Web- Enemies Damaged by your grenades chain deadly lightning to nearby enemies. Ionic Blink – Press the Sprint button to teleport during Stormtrance. Gale Force- This electrocuting Melee Ability hits at extended range and recharges your Super, grenade, and melee energy. Landfall – On casting Stormtrance, fire a bolt of lightning into the ground, creating a devastating shockwave under you. Rising Storm – Your Rift charges faster when allies are near. Arc Soul – Your Rift now grants you or any ally who uses it an Arc Soul to aid you in batlle. Super: Chaos Reach – fires a long-range, intense beam of arc energy. Can be deactivated early to reserve energy. Ionic Traces – arc kills sometimes create Ionic Traces, sparks of raw energy that travel back towards you and can be collected to recharge abilities. Pulsewave – should you be injured while collecting Ionic Traces, Pulsewave provides both you and allies a speed boost. Ball Lightning – allows you to fire out a long-distance ball of arc energy that detonates after a delay, firing an arc bolt downwards. Super: Golden Gun – summons a flaming pistol that disintegrates enemies with Solar Light. Carries six bullets, each of which can kill a low-tier mob in one shot, but it’ll take two to finish an enemy Guardian in PvP. Swarm Grenade – a grenade that detonates on impact, releasing multiple drones that seek nearby enemies. Incendiary Grenade – A grenade whose explosion catches enemies on fire. Tripmine Grenade – an explosive grenade that sticks to surfaces and detonates upon enemies who pass through its laser trigger. Marksman’s Dodge – dodge to perform an evasive maneuver with a steady hand. Dodging automatically reloads your weapon. Gambler’s Dodge – dodge to perform a deft tumble, avoiding enemy attacks. Dodging near enemies fully recharges your melee ability. High Jump – while airborne, jump a second time to reach greater heights. Triple Jump – while airborne, sustain your air control with a second or third jump. Strafe Jump – while airborne, jump a second time with strong directional control. Explosive Knife – throw a knife from a distance that explodes shortly after impact with this melee ability. Chains of Woe – Precision kills increase weapon reload speed for you and nearby allies. Six-Shooter – Golden Gun can be fired quickly up to six times, but has a shorter duration. Deadshot – Significantly improves your ability to hit with Golden Gun. Knife-Juggler – throw a knife from a distance. Precision knife kills with this melee ability immediately recharges it. Practice Makes Perfect – enter a trance with each precision hit, reducing the cooldown of your Super. Crowd-Pleaser – enables precision damage with Golden Gun. Precision hits with Golden Gun generate Orbs of Light. Line ‘em Up – Precision hits with Golden Gun increase its damage and extend its duration. Super: Blade Barrage – allows you to throw a handful of explosive solar knives while in the air. Multiple barrages can be thrown in one super activation. Knife Trick – throw a fan of burning blades that light enemies on fire. Playing with Fire – killing burning enemies recharges your Knife Trick melee. The Burning Edge – setting fire to enemies recharges your dodge. Super:Arc Staff – conjure a staff powered by arc light, and run around hitting things with it. Skip Grenade – a grenade which splits on impact, creating multiple projectiles which seek enemies. FluxGrenade – an explosive grenade which deals additional damage when attached to enemies. Arcbolt Grenade – a grenade that chains bolts of lightning to nearby enemies. Marksman’s Dodge – automatically reloads your weapon when dodging. Gambler’s Dodge – dodging near enemies generates melee energy. High Jump – upgrades Double Jump with even greater height. Triple Jump – upgrades Double Jump with a third jump. Strafe Jump – upgrades Double Jump with better directional control while in the air. Combat Flow – melee kills recharge your dodge skill. Deadly Reach – dodging temporarily increases melee range. Lethal Current – Arc Staff attacks hit twice after dodging. Shocking Blow – striking an enemy with this powerful melee attack emits a deadly bolt of lightning from your fist. Disorienting Blow – striking an enemy with this debilitating melee attack. disorients the target. Killing a target with Disorienting Blow instantly recharges it. Lightning Reflexes – take less damage while dodging with Arc Staff active. Battle Meditation – when critically wounded, melee and grenade skills recharge faster. Focused Breathing – sprinting reduces dodge cooldown, increased sprint speed. Super: Whirlwind Guard – spin your arcstaff by holding the aim button in order to reflect back projectiles. A successful deflect triples the staff’s damage for a short duration. Tempest Strike – sliding before activating melee performs an uppercut with the arcstaff, throwing the target into the air and leaving a trail of Arc energy behind. Ebb and Flow – all arc abilities electrify enemies, and following up with a melee stuns them and recharges your abilities. Lightning Weave – all melee attacks increases reload speed. Super:Shadowshot -Fires a non-lethal Void Anchor that slows affected enemies, causes them to take more damage, and prevents them from using abilities. Vortex Grenade – a grenade that creates a vortex that continually damages enemies caught inside. Spike Grenade – a grenade that attaches to any surface and emits a torrent of damaging void light. Voidwall Grenade – a grenade that creates a horizontal wall of burning Void Light. Snare Bomb – Throw a smoke bomb trap from a distance with this Melee Ability. The smoke bomb sticks to surfaces and detonates when enemies are near, slowing and disorienting them. Keen Scout – Sprint and sneak faster, and gain an enhanced tracker. Tethered enemies are marked for easy tracking. Deadfall- The Void Anchors fired from Shadowshot become traps and wait for prey. Void Anchors have increased range and last longer. Vanishing Step- Dodging makes you vanish from sight for a short time. Vanish in Smoke – Throw a smoke bomb explosive from a distance with this Melee Ability. The smoke bomb creates a cloud that makes you and nearby allies invisible. Lockdown – Grenade and smoke effects last twice as long, allowing for strong territorial control and increased damage potential. Heart of the Pack – Killing tethered enemies creates Orbs of Light and increases Mobility, Recovery, and Resilience for you and nearby allies. Moebius Quiver – Fire Shadowshot multiple times in rapid succession. Shadowshot deals massive damage against tethered enemies. Super: Spectral Blades – allows you to become invisible in order to get behind enemies and stab them with void blades. Flawless Execution – precision kills scored while your health is full allow you to become invisible and gain Truesight, providing the ability to see enemies through walls. 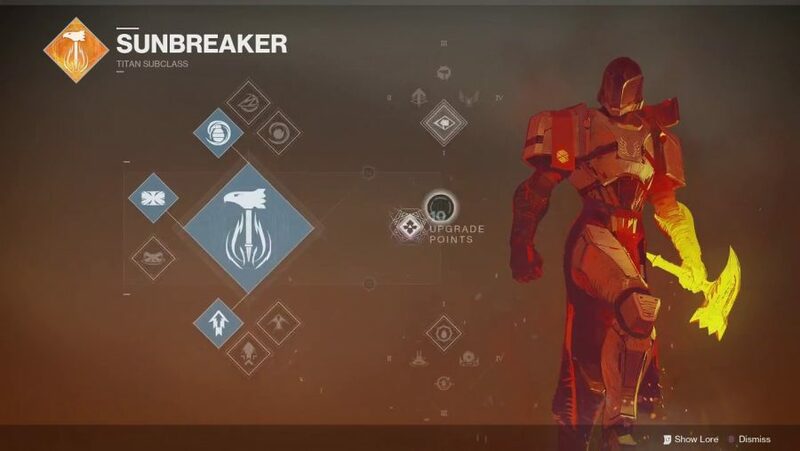 Shattering Strike – perform a melee attack shortly after activating Flawless Execution and the target will be debuffed, reducing their damage output. Corrosive Smoke – smoke bombs now explode in a line pattern, heavily damaging foes and slowing anyone caught within it. Super:Fists of Havoc – supercharges your fists and slam the ground with the force of a maelstrom. Pulse Grenade – a grenade that periodically damages enemies inside its explosion radius. Flashbang Grenade – an explosive grenade that disorients enemies it damages. Towering Barricade – a large barrier that can be used to reinforce a position with cover from enemy fire. Rally Barricade – a small barrier that allows you to peek over it while aiming down sights and instantly reloads your equipment when you take cover. High Lift – Jump while airborne to activate Lift and launch into the air at greater heights. Srafe Lift – Jump while airborne to activate Lift and launch into the air with strong directional control. Catapult Lift – Jump while airborne to activate Lift and launch into the air with a strong initial burst of momentum. Aftershocks – damaging enemies with Seismic Strike recharges your grenade. Magnitude – gain an additional grenade charge. Increases the duration of grenade effects. Terminal Velocity – Fists of Havoc’s ground slam attack leaves a damage-dealing field in its wake and deals more damage the longer it’s in the air. Seismic Strike – while sprinting, active this melee ability to slam shoulder-first into your target and release an Arc explosion on impact. Frontal Assault – strike an enemy with this melee ability to reload your weapon and increase your weapon stability. Reversal – melee kills immediately trigger health regeneration. Knockout – critically wounding an enemy or breaking their shields increases your melee range and damage. Trample – killing enemies with Fists of Havoc extends its duration. Super: Thundercrash – sends you flying through the air to strike a targeted area with a hand-held ball of arc energy. Impact Conversion – inflicting melee damage helps recharge your super energy. Inertia Override – sliding into ammo pickups will automatically reload your equipped weapon and increase damage for a short duration. 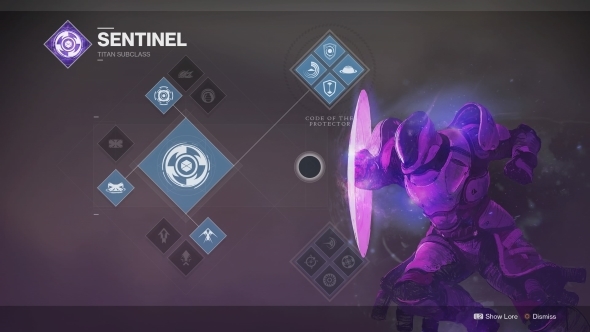 Super: Sentinel Shield – Summon a shield of Void Light. The shield can be used to attack, guard, and perform a Shield Throw. Magnetic Grenade – a grenade that attaches to enemies and explodes twice. Suppressor Grenade – an explosive grenade that prevents enemies from using abilities for a short time. Rally Force – Melee kills restore health for you and nearby allies. Turn The Tide – Your Overshield from Defensive Strike lasts longer and increases melee damage and reload speed. Ward of Dawn – When Super energy is full, press and hold activation key to create a shielding dome to protect you and your allies. Defensive Strike – Kill an enemy with this melee ability to create an overshield around you and nearby allies. Shield Bash – After sprinting for a short time, use this melee ability to unleash a devastating Shield Bash that disorientates enemies. Superior Arsenal – Grenade kills recharge your grenade energy. In The Trenches – Kills while surrounded by enemies reduce the cooldown of your Super. Second Shield – Gain an additional Shield Throw charge while Sentinel Shield is active. Super: Banner Shield – holding guard while using Sentinel Shield creates a barrier wall of light that blocks enemy projectiles but allows allied bullets to pass through. Shooting through the shield extends the duration of the super. Controlled Demolition – all void damage attaches a Void Detonator to your melee. Subsequence damage causes the detonator to explode. Resupply – Void Detonator explosions partially recharge grenade abilities, and heals both you and nearby allies. Tactical Strike – a melee attack that creates a Void explosion, which sets off any nearby Void Detonators. Additional detonators are applied to enemies caught in the explosion. Super:Hammer of Sol – Activate to hurl flaming hammer projectiles at enemies, dealing significant damage with each hit. Incendary Grenade – a grenade whose explosion sets enemies on fire. Thermite Grenade – a grenade that sends forward a burning line of fire. Fusion Grenade – an explosive grenade that burns enemies when it attaches to targets. Hammer Strike- While sprinting, use this Melee Ability to unleash a blazing Hammer strike that weakens enemies. Tempered Metal- Solar Ability kills grant you and nearby allies bonus movement and reload speed. Battle-Forge- Enemies killed by Hammer of Sol explode. Vulcan’s Rage – Hammers shatter into explosive molten embers on impact. Mortar Blast – Strike an enemy with this Melee Ability to release a Solar explosion setting nearby enemies on fire. Sun Warrior- Solar Ability kills restore your health. Grenade and Melee Ability kills leave a deadly Sunspot in their wake. Rings of Fire- While standing in a Sunspot, your Solar Abilities recharge faster and your Super lasts longer. Solar Siege- Hammers create a Sunspot on impact. While standing in Sunspots, you throw hammers faster. Super: Burning Maul – summons a flaming two-handed warhammer that can either strike with fast, consecutive blows, or be swung down in an overhead swing that create fire tornadoes. Throwing Hammer – throw a solar hammer that must be then collected from where it falls. Picking it up fully recharges melee energy. Tireless Warrior – picking up your thrown hammer triggers instant health regeneration. Roaring Flames – Solar ability kills and retrieving your Throwing Hammer increases a damage multiplier, up to 3x.